It’s free, easy, and has been scientifically proven to diminish anxiety, stress, and even racial bias. Experts Pico Iyer and Mitra Rahbar explain how meditation can profoundly affect a person’s sense of well being, and why we should be investing in our minds the way we do our bodies. Larry King: Multiple studies have shown that meditation is linked to decreased anxiety and increased compassion. Are you a big supporter of meditation? Mitra Rahbar: I’m a huge supporter of meditation. 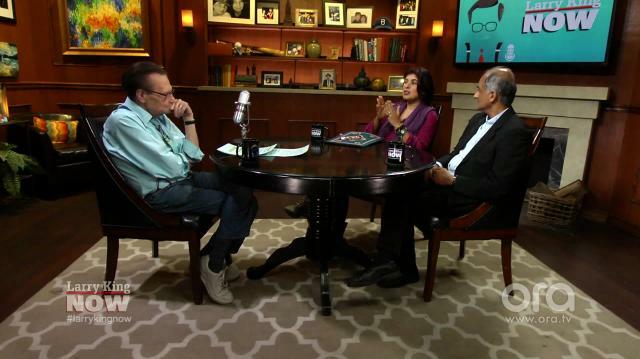 Larry King: What does it do – to think about nothing? Mitra Rahbar: Well you train your mind to think about nothing, and in that nothing something miraculous happens, you connect to yourself. We have so much chatter, you know? We have so much noise inside of us, you know? And when we sit to meditate, which takes practice, we slowly unravel and where we unravel we’ll see the pure us, and in that space there is a peace, a clarity, that we get. So whatever we put into meditation we get it back so much in return. Larry King: We’ve heard all our lives, all our lives that meditation is wonderful. Why doesn’t everybody do it? Pico Iyer: I know. It’s like going to the health club, or taking your medicine. I often think we have this double standard. I remember my doctor said to me a few years ago, you’re fine but you’re not getting any younger. You should exercise 30 minutes every day. And as soon as he said that I signed up at the health club, I religiously exercise. But a little later a friend of mine said, well why don’t you just sit quietly for 30 minutes everyday. You’re always running around, and flying around, that would help you. I said ‘no, I don’t have time.’ Especially now that I’m going to the health club. But it’s so short sighted because it’s that inner exercise that is much more essential to my well being than just my physical health, because if you know… we all know that if you’re really buff and toned but your mind is shaky, you’re in big trouble. Whereas, if your mind is strong, even when your body is weak you can get through. But I think, we grasp at what we can see and we forget the important stuff is what we can’t see. Mitra Rahbar: And I think that the key is also Larry that people get sometimes scared of meditation. And I always say, walk into it gently. Larry King: Scared of what? Mitra Rahbar: Of sitting, of sitting by themselves. ‘How am I going to do this? It’s going to make me anxious, I’m getting anxious just thinking of meditating.’ And meditation comes in different forms. You know the Native Americans did walking meditation, where they took a walk and every step they took they walked away from thinking. You know, a painter who paints everyday – that’s a form of meditation. So meditation is not in one form, but it is to lose ourselves to that noise. And come into our own space.